Echoing the views taken in English decisions that judicial review based solely on the test of ‘source of power, whether statutory or prerogative’ is too restrictive, and following the dicta laid down in Andi Mukta Sadguru Shree Muktajee Vandas Swami Suvarna Jayanti Mahotsav Smarak Trust & Ors. vs. V.R. Rudani & Ors., (1989) 2 SCC 691 and Zee Telefilms Ltd. vs. Union of India (2005) 4 SCC 649, the Supreme Court in a judgment rendered today, favored adopting the complementary test of examining the characteristics of the function being performed in case application of the former test did not yield a satisfactory outcome. Opining that the term “authority” used in Article 226, in the context, must receive a liberal meaning unlike the term in Article 12, the Supreme Court today held that an aided educational institution like government institutions discharge public function by way of imparting education to students and therefore they are amenable to the writ jurisdiction under Article 226 of the Constitution. The Apex Court was considering an appeal filed (with the appellant appearing in person) against the judgment and order dated 04.07.2013 passed by the High Court of Judicature at Madras in Writ Appeal No. 932 of 2013 whereby the Division Bench of the High Court allowed the writ appeal filed by the respondent University against the order dated 08.04.2013 passed by the Single Judge of the High Court in W.P. No.12676 of 2012 and, in consequence, dismissed the writ petition filed by the appellant herein as being not maintainable. The services of the appellant, Dr. Janet Jeyapaul, who was a faculty member in S.R.M. University-the 1st respondent which is a deemed university under Section 3 of the University Grants Commission Act, 1956 (in short “the UGC Act”), was terminated by the 1st respondent-University for the alleged failure to take classes of the students of B.Sc. Third Year degree course and M.Sc. First Year degree course. 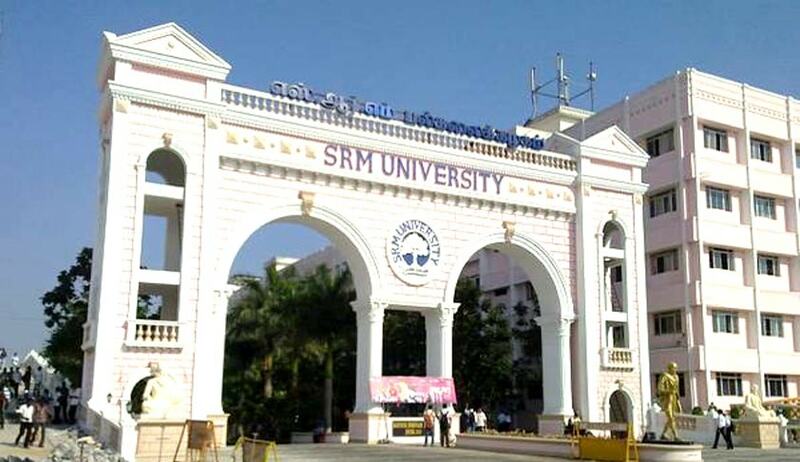 Though the appellant submitted her replies denying the allegations and claiming that she took classes for both the courses, the same was not accepted by SRM University which served a notice dated 04.04.2012 on the appellant mentioning therein that the same shall be treated as one month’s notice and she would be relieved from the services w.e.f. 04.05.2012. Challenging the actions of the 1st respondent, the appellant filed a writ petition before the single judge of the Madras High Court. By order dated 08.04.2013, the Single Judge of the High Court allowed the writ petition, quashed the termination notice and directed the respondents to reinstate the appellant into service. Against the said order of the Single Judge, the 1st respondent-University filed Writ Appeal before a Division Bench the High Court. By impugned judgment dated 04.07.2013, the Division Bench of the High Court allowed the appeal. It was held that the writ petition filed by the appellant against respondent No.1 was not maintainable as according to the Division Bench, the 1st respondent is neither a State nor an authority within the meaning of Article 12 of the Constitution of India and hence it cannot be subjected to writ jurisdiction of the High Court under Article 226 of the Constitution to examine the legality and correctness of the dismissal order. The Division Bench, therefore, did not examine the merits of the case made out by the appellant successfully before the Single Judge. The Division Bench, however, granted liberty to the appellant to approach the Tribunal for ventilating of her grievance on merits. Aggrieved by the said judgment, the appellant preferred appeal by way of special leave to the Supreme Court. Since the appeal involved a legal issue and the appellant had no legal assistance, the Court requested senior counsel Mr. Harish Salve, who was present in Court, to assist the Court to enable it to properly appreciate and decide the issues arising in the case. According to Mr. Salve, while deciding the question as to whether the writ lies under Article 226 of the Constitution of India against any person, juristic body, organization, authority etc., the test is to examine in the first instance the object and purpose for which such body/authority/organization is formed so also the activity which it undertakes to fulfill the said object/purpose. Referring to the english decisions in Breen vs. A.E.U. (1971) 2 QB 175, R. vs. Panel on Take-overs and Mergers, ex parte Datafin Plc and another (Norton Opax Plc and another intervening) (1987) 1 All ER 564, E.S. Evans vs. Charles E.Newton 382 US 296 (1966) and of this Court in Andi Mukta Sadguru Shree Muktajee Vandas Swami Suvarna Jayanti Mahotsav Smarak Trust & Ors. vs. V.R. Rudani & Ors., (1989) 2 SCC 691 and Zee Telefilms Ltd. vs. Union of India (2005) 4 SCC 649, Mr. Harish Salve submitted that perusal of these authorities/decisions would go to show that there has been a consistent view of all the learned authors and the Courts all over the world including in India that the approach of the Court while deciding such issue is always to test as to whether the concerned body is formed for discharging any "Public function" or "Public duty" and if so, whether it is actually engaged in any public function or/and performing any such duty. Mr. Salve then submitted that if the aforesaid twin test is found present in any case then such person/body/organization/authority, as the case may be, would be subjected to writ jurisdiction of the High Court under Article 226 of the Constitution. He elaborated his submission by pointing out that the expression "any person or authority" used in Article 226 are not confined only to statutory authorities and instrumentalities of the State but may in appropriate case include any other person or body performing "public function/duty". Learned counsel urged that emphasis is, therefore, always on activity undertaken and the nature of the duty imposed on such authority to perform and not the form of such authority. According to Mr. Harish Salve, once it is proved that the activity undertaken by the authority has a public element then regardless of the form of such authority it would be subjected to the rigor of writ jurisdiction of Article 226 of the Constitution. Mr. Salve then urged that in the light of several decisions of the Apex Court, one cannot now perhaps dispute that "imparting education to students at large" is a "public function" and, therefore, if any body or authority, as the case may be, is found to have been engaged in the activity of imparting education to the students at large then irrespective of the status of any such authority, it should be made amenable to writ jurisdiction of the High Court under Article 226 of the Constitution. He further pointed out that the case in hand clearly showed that the 1st respondent, a juristic body is engaged in imparting education in higher studies and what is more significant is that it is conferred with a status of a “Deemed University" by the Central Government under Section 3 of the UGC Act. These two factors, according to Mr. Harish Salve, would make respondent No. 1 amenable to writ jurisdiction of the High Court under Article 226 because it satisfies the twin test laid down for attracting the rigor of writ jurisdiction of the High Court. In reply, senior counsel Mr. Sanjay R. Hegde appearing for the 1st respondent-University while supporting the impugned order contended that if the Apex Court holds that respondent No. 1 is amenable to writ jurisdiction then apart from employees even those who are otherwise dealing with respondent No. 1 would start invoking writ jurisdiction which, according to him, would open the flood gate of litigation in courts. It was argued by Mr. Hegde that the management of the college being a trust registered under the Bombay Public Trust Act is not amenable to the writ jurisdiction of the High Court. In support of the contention, Mr. Hegde relied upon two decisions of this Court: (a) Executive Committee of Vaish Degree College, Shamli v. Lakshmi Narain, (1976) 2 SCC 58 and (b) Deepak Kumar Biswas v. Director of Public Instructions, (1987) 2 SCC 252. In the first of the two cases, it was observed that the management of the college was not a statutory body since not created by or under a statute. It was emphasised that an institution which adopts certain statutory provisions will not become a statutory body and the dismissed employee cannot enforce a contract of personal service against a non-statutory body. On a consideration of the arguments advanced at the Bar, the bench comprising of Justice J Chelameswar and Justice Abhay Manohar Sapre accepted the contentions of Mr. Harish Salve. “AMENABILITY TEST BASED ON THE SOURCE OF POWER"
“Public money paid as government aid plays a major role in the control, maintenance and working of educational institutions. The aided institutions like government institutions discharge public function by way of imparting education to students. They are subject to the rules and regulations of the affiliating University. Their activities are closely supervised by the University authorities. Employment in such institutions, therefore, is not devoid of any public character. So are the service conditions of the academic staff. When the University takes a decision regarding their pay scales, it will be binding on the management. The service conditions of the academic staff are, therefore, not purely of a private character. It has super-added protection by University decisions creating a legal right-duty relationship between the staff and the management. When there is existence of this relationship, mandamus cannot be refused to the aggrieved party. “31. Be that as it may, it cannot be denied that the Board does discharge some duties like the selection of an Indian cricket team, controlling the activities of the players and others involved in the game of cricket. These activities can be said to be akin to public duties or State functions and if there is any violation of any constitutional or statutory obligation or rights of other citizens, the aggrieved party may not have a relief by wayof a petition under Article 32. But that does not mean that the violator of such right would go scot-free merely because it or he is not a State. Under the Indian jurisprudence there is always a just remedy for the violation of a right of a citizen. Though the remedy under Article 32 is not available, an aggrieved party can always seek a remedy under the ordinary course of law or by way of a writ petition under Article 226 of the Constitution, which is much wider than Article 32. Applying the aforesaid principle of law to the facts of the case , the Supreme Court came to the conclusion that the Division Bench of the High Court erred in holding that respondent No. 1 is not subjected to the writ jurisdiction of the High Court under Article 226 of the Constitution. “In other words, it should have been held that respondent No.1 is subjected to the writ jurisdiction of the High Court under Article 226 of the Constitution,’ said the Bench. The Court accordingly while reversing the finding of the Division Bench of the Madras High Court held that the appellant's writ petition under Article 226 of the Constitution against respondent No. 1 is maintainable. Mr. Hegde then contended that even assuming that the appellant's writ petition is maintainable, yet it should not be entertained for hearing on merits and instead the appellant be granted liberty to approach the District Judge/Additional District Judge of the concerned District which is designated as Tribunal till formation of regular Tribunal for redressal of her grievances as directed by the Constitution Bench in Para 231 of T.M.A. Pai's case. The Bench however did not accept Mr. Hegde’s contention and said that since in this case, the Single Judge not only entertained the appellant's writ petition but allowed the writ petition on merits whereas the Division Bench held the writ petition as not maintainable and thus declined to examine the merits of the controversy involved in the writ petition, it did not consider it proper to direct the appellant at this stage to approach the Tribunal and file a dispute before the Tribunal. The Apex Court the remanded the case to the Division Bench of the High Court to decide the respondent's appeal on merits on the question as to whether the Single Judge was justified in allowing the writ petition on merits.